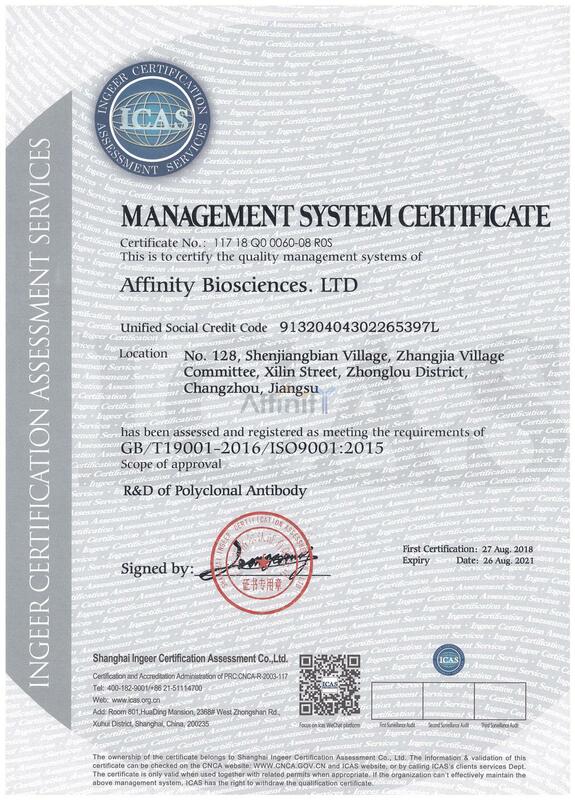 The antibody is from purified rabbit serum by affinity purification via sequential chromatography on phospho- and non-phospho-peptide affinity columns. Phospho-AMPK alpha (Thr172) Antibody detects endogenous levels of AMPK alpha only when phosphorylated at Threonine 172. Rabbit IgG in phosphate buffered saline , pH 7.4, 150mM NaCl, 0.02% sodium azide and 50% glycerol.Store at -20 °C.Stable for 12 months from date of receipt. A synthesized peptide derived from human AMPK alpha around the phosphorylation site of Threonine 172. AMPKA2 a protein kinase of the CAMKL family. The holoenzyme consists of a catalytic subunit (alpha) and two regulatory subunits (beta, gamma). Catalytic subunit of AMP-activated protein kinase (AMPK), an energy sensor protein kinase that plays a key role in regulating cellular energy metabolism. In response to reduction of intracellular ATP levels, AMPK activates energy-producing pathways and inhibits energy-consuming processes: inhibits protein, carbohydrate and lipid biosynthesis, as well as cell growth and proliferation. AMPK acts via direct phosphorylation of metabolic enzymes, and by longer-term effects via phosphorylation of transcription regulators. Also acts as a regulator of cellular polarity by remodeling the actin cytoskeleton; probably by indirectly activating myosin. Regulates lipid synthesis by phosphorylating and inactivating lipid metabolic enzymes such as ACACA, ACACB, GYS1, HMGCR and LIPE; regulates fatty acid and cholesterol synthesis by phosphorylating acetyl-CoA carboxylase (ACACA and ACACB) and hormone-sensitive lipase (LIPE) enzymes, respectively. Regulates insulin-signaling and glycolysis by phosphorylating IRS1, PFKFB2 and PFKFB3. AMPK stimulates glucose uptake in muscle by increasing the translocation of the glucose transporter SLC2A4/GLUT4 to the plasma membrane, possibly by mediating phosphorylation of TBC1D4/AS160. Regulates transcription and chromatin structure by phosphorylating transcription regulators involved in energy metabolism such as CRTC2/TORC2, FOXO3, histone H2B, HDAC5, MEF2C, MLXIPL/ChREBP, EP300, HNF4A, p53/TP53, SREBF1, SREBF2 and PPARGC1A. Acts as a key regulator of glucose homeostasis in liver by phosphorylating CRTC2/TORC2, leading to CRTC2/TORC2 sequestration in the cytoplasm. In response to stress, phosphorylates 'Ser-36' of histone H2B (H2BS36ph), leading to promote transcription. Acts as a key regulator of cell growth and proliferation by phosphorylating TSC2, RPTOR and ATG1/ULK1: in response to nutrient limitation, negatively regulates the mTORC1 complex by phosphorylating RPTOR component of the mTORC1 complex and by phosphorylating and activating TSC2. In response to nutrient limitation, promotes autophagy by phosphorylating and activating ATG1/ULK1. In response to nutrient limitation, phosphorylates transcription factor FOXO3 promoting FOXO3 mitochontrial import (By similarity). AMPK also acts as a regulator of circadian rhythm by mediating phosphorylation of CRY1, leading to destabilize it. May regulate the Wnt signaling pathway by phosphorylating CTNNB1, leading to stabilize it. Also has tau-protein kinase activity: in response to amyloid beta A4 protein (APP) exposure, activated by CAMKK2, leading to phosphorylation of MAPT/TAU; however the relevance of such data remains unclear in vivo. Also phosphorylates CFTR, EEF2K, KLC1, NOS3 and SLC12A1. Ubiquitinated.Phosphorylated at Thr-183 by STK11/LKB1 in complex with STE20-related adapter-alpha (STRADA) pseudo kinase and CAB39. Also phosphorylated at Thr-183 by CAMKK2; triggered by a rise in intracellular calcium ions, without detectable changes in the AMP/ATP ratio. CAMKK1 can also phosphorylate Thr-183, but at a much lower level. Dephosphorylated by protein phosphatase 2A and 2C (PP2A and PP2C). Phosphorylated by ULK1 and ULK2; leading to negatively regulate AMPK activity and suggesting the existence of a regulatory feedback loop between ULK1, ULK2 and AMPK. Dephosphorylated by PPM1A and PPM1B. AMPK is a heterotrimer of an alpha catalytic subunit (PRKAA1 or PRKAA2), a beta (PRKAB1 or PRKAB2) and a gamma non-catalytic subunits (PRKAG1, PRKAG2 or PRKAG3). Interacts with FNIP1 and FNIP2. The AIS (autoinhibitory sequence) region shows some sequence similarity with the ubiquitin-associated domains and represses kinase activity.Belongs to the protein kinase superfamily. CAMK Ser/Thr protein kinase family. SNF1 subfamily. · Human Diseases > Cardiovascular diseases > Hypertrophic cardiomyopathy (HCM). · Human Diseases > Endocrine and metabolic diseases > Insulin resistance. · Human Diseases > Endocrine and metabolic diseases > Non-alcoholic fatty liver disease (NAFLD). · Organismal Systems > Endocrine system > Adipocytokine signaling pathway. · Organismal Systems > Endocrine system > Glucagon signaling pathway. · Organismal Systems > Endocrine system > Oxytocin signaling pathway. Sample Preparation For Western Blotting. Phospho-AMPK alpha (Thr172) Antibody for IHC in human colon. AF3423 staining 293 by IF/ICC. The sample were fixed with PFA and permeabilized in 0.1% Triton X-100,then blocked in 10% serum for 45 minutes at 25°C. The primary antibody was diluted at 1/200 and incubated with the sample for 1 hour at 37°C. An Alexa Fluor 594 conjugated goat anti-rabbit IgG (H+L) Ab, diluted at 1/600, was used as the secondary antibody. af3423 staining C2C12 cells by ICC/IF. Cells were fixed with PFA and permeabilized in 0.1% saponin prior to blocking in 10% serum for 45 minutes at 37°C. The primary antibody was diluted 1/400 and incubated with the sample for 1 hour at 37°C. A Alexa Fluor 594 conjugated goat polyclonal to rabbit IgG (H+L), diluted 1/600 was used as secondary antibody. ELISA analysis of AF3423 showing specificity to Phospho-AMPK alpha (Thr172) peptide. Peptides concentration: 1ug/ml. FIGURE 4 | Effect of CIHH on the protein expression of AMPK, p-AMPK, PDK4 and PGC-1α in left ventricular myocytes before and after I/R. (A) Protein expression of AMPK and p-AMPK; (B) Protein expression of PDK4; (C) Protein expression of PGC-1α. CON, control group; CIHH, chronic intermittent hypobaric hypoxia; Pre, pre-ischemia; I/R, ischemia/reperfusion. Data are expressed as the mean ± SD (n = 6 in each group). *P < 0.05 vs. corresponding CON group. Fig. 4. Myostatin regulated translation elongation through AMP. C2C12 myotubes were treated with various concentration recombinant myostatin (0, 0.01,0.1, 1, 2, 3 µg/ml) for 48 h andthen lysed and cellular extracts were analyzed by Western blot with anti-AMPK(A). 10). et al. Hydrogen sulfide improves endothelial dysfunction in hypertension by activating peroxisome proliferatoractivated receptor delta/endothelial nitric oxide synthase signaling. Figure 3. Compound C reversed the effects of Sanguinarine on the differentiation of MC3T3-E1 cells. MC3T3-E1 cells were pretreated with 10 μM Compound C for 1 h and then exposed to 2 M Sanguinarine (SAN). Mock cells were cultured without any treatment. (A, B) At 48 h after treatment, the levels of AMPK1 and p-AMPK (A), and ALP activity in the cultured medium (B) were analyzed. (C) mRNA levels of Bmp2, Osx and Opg were detected by real-time PCR. (D) Protein levels of Bmp2, Smad1, pSmad1, Osx and Opg were determined by Western blot. ***P <0.001 versus DMSO; +++P <0.001 versus Compound C.
Tips: For phospho antibody, we provide phospho peptide（0.5mg) and non-phospho peptide(0.5mg). Blocking peptides are peptides that bind specifically to the target antibody and block antibody binding. 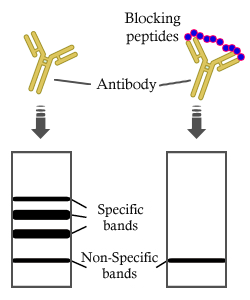 These peptide usually contains the epitope recognized by the antibody. Antibodies bound to the blocking peptide no longer bind to the epitope on the target protein. This mechanism is useful when non-specific binding is an issue, for example, in Western blotting (immunoblot) and immunohistochemistry (IHC). By comparing the staining from the blocked antibody versus the antibody alone, one can see which staining is specific; Specific binding will be absent from the western blot or immunostaining performed with the neutralized antibody. Synthetic peptide was lyophilized with 100% acetonitrile and is supplied as a powder. Reconstitute with 0.1 ml DI water for a final concentration of 10 mg/ml.The purity is >90%,tested by HPLC and MS.Storage	Maintain refrigerated at 2-8°C for up to 6 months. For long term storage store at -20°C. IMPORTANT: For western blots, incubate membrane with diluted antibody in 5% w/v milk , 1X TBS, 0.1% Tween®20 at 4°C with gentle shaking, overnight.